Nicole and I have a mutual love of all things Christmas… so when we were getting together for a birthday celebration, we decided to make it holiday-themed too! During our planning, Nicole asked if we could make mulled wine. Now I’m not sure who’s going to say no to that, so it was mulled wine time. To make mulled wine, you heat up a bit of red wine with spices to make a syrup. Then you add the rest of the wine and just heat it enough to have a warm drink without burning off all of the alcohol. 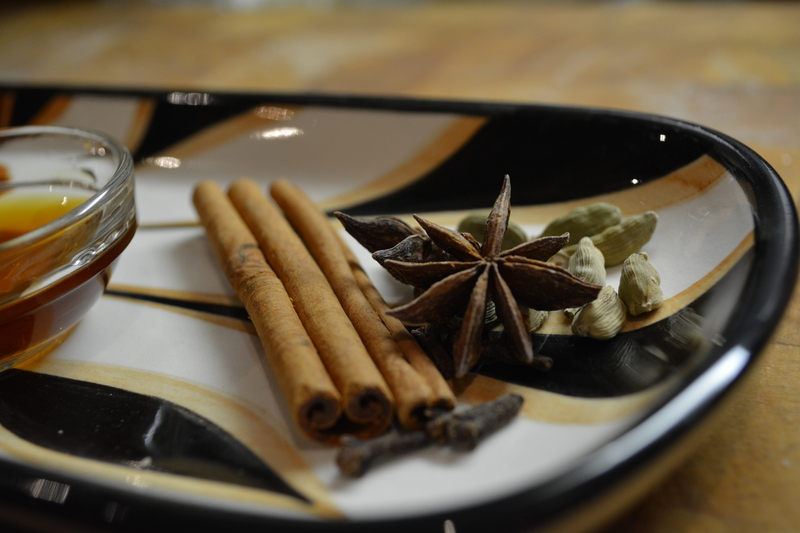 We went traditional on the spices — cinnamon, star anise, nutmeg, cloves, and cardamom. We added orange peel, sugar and some of the Maker’s Mark Bourbon Vanilla I made last year. This is one of those recipes where you can easily change around the spices you add. Don’t have cardamom? No problem, add something else you like — mace, allspice, or ginger would all be wonderful here. Also, any citrus you have will work a treat. I love using orange peel, but lemon or lime would also be wonderful in this mulled wine. We used a bottle of Merlot for this recipe — but Chianti, Malbec or Cabernet Sauvignon would all be good choices here. I tend to choose “cheap and cheerful” bottles of wine when I’m making mulled wine, as the spices and sugar tend to take over. If you want the recipe to be vegan-friendly, make sure that you use a vegan wine. You can check Barnivore to find a vegan-friendly wine. After making the syrup, when we added the rest of the bottle of wine, we also tossed in a good helping of fresh cranberries. 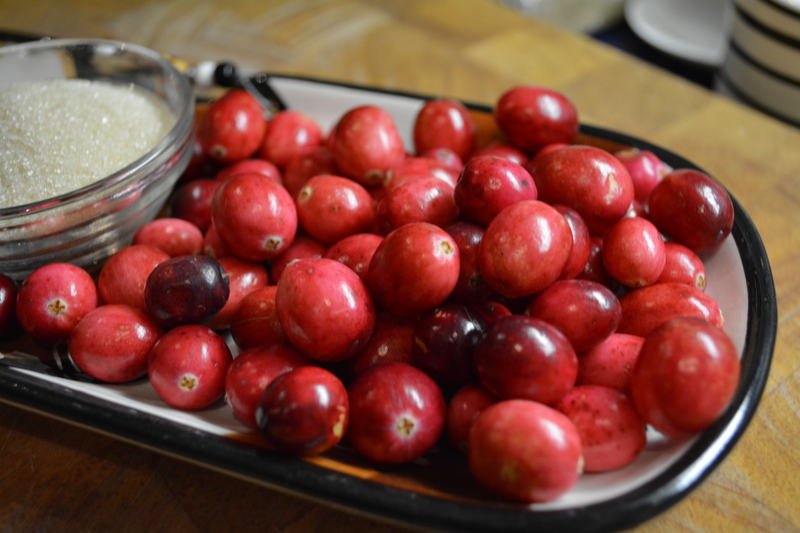 They don’t do much for the flavour, but they are so pretty bobbing about in your mug. Frozen cranberries would work well here too, but make sure you defrost them before adding them to the pot, or you may have to cook off a lot of the alcohol in the wine in order to get it warm enough. 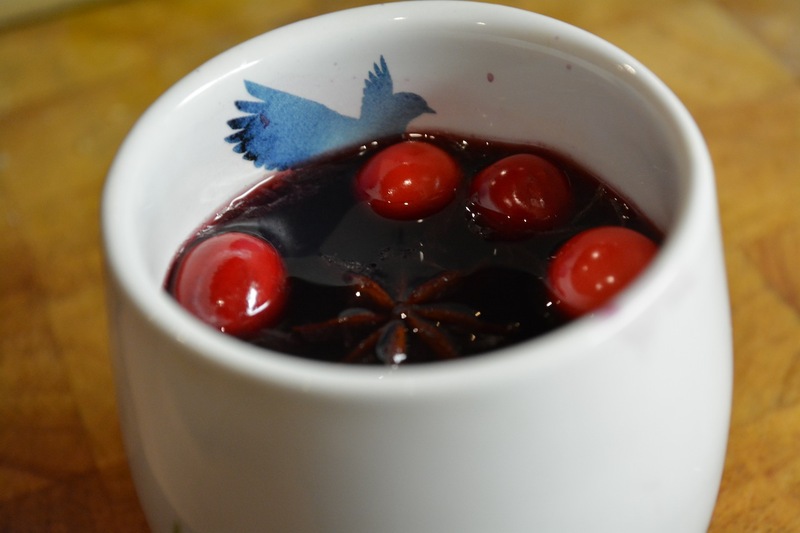 This mulled wine is definitely the taste of Christmas in a glass. I’m happy to be serving it for the rest of the month around here. 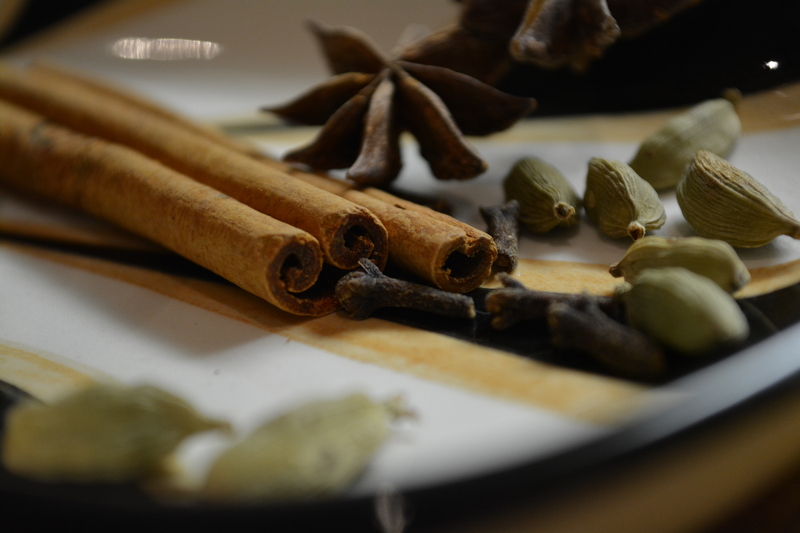 Cinnamon, star anise, nutmeg, cloves & cardamom are instant bringers of festive cheer. This is a warming holiday beverage that will make your entire home smell like joy. I used my bourbon vanilla extract here but any good quality vanilla extract will do. 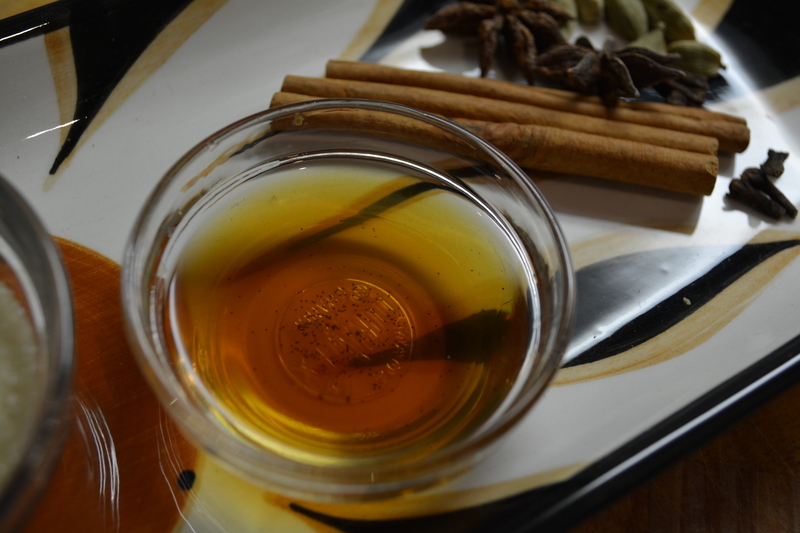 Using part of the wine first to make a spiced syrup base means that you don’t burn off all of the alcohol in the wine. Each bottle of wine makes about 4 glasses of mulled wine. Peel and juice the orange, and discard the leftover pulp and seeds. Place the orange peel and juice in a large pot, along with the sugar, vanilla, and spices. Pour in red wine until the sugar is just covered. Simmer over medium heat until the sugar is dissolved. Bring the pot to a boil, and let boil for 5 minutes until the liquid has become a thick syrup. 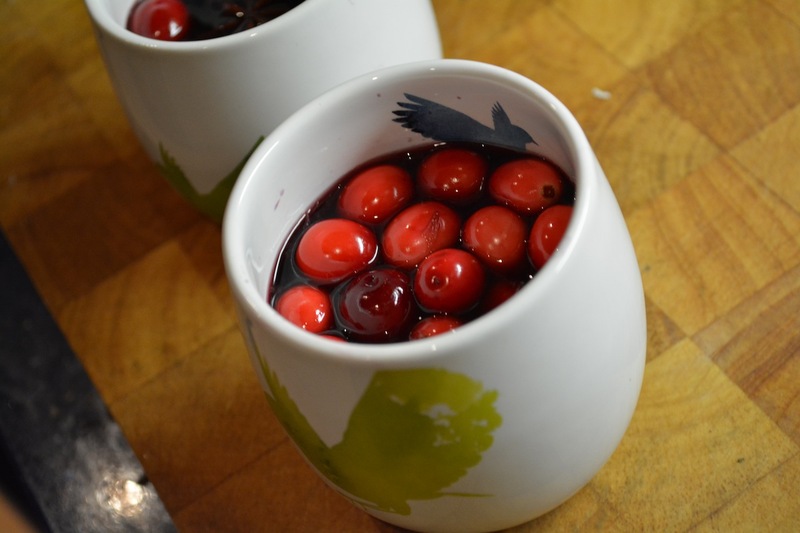 Turn the heat down to low, and pour in the rest of the wine and add the cranberries. Heat about 5 minutes and serve warm, ladled into glasses or mugs. and it works as an air freshener as well! Definitely making this – maybe tonight! Nice — let me know if you like it!